Focusing on expanding fitness levels by ensuring all muscles are engaged during exercises, the Fitness Mad PVC medicine ball grants a good workout for the whole body. Allowing for a full range of motion, this 5kg (11lbs) ball can broaden your drill routine with completely new moves, therefore it’s an excellent choice for professional athletes as well as people who wish to achieve a great summer physique. Designed from PVC to ensure great and firm grip, the medicine ball is waterproof and guarantees a fantastic way to strengthen up your body including abs. for submitting product information about Fitness Mad 5Kg PVC Medicine Ball We aim to answer all questions within 2-3 days. 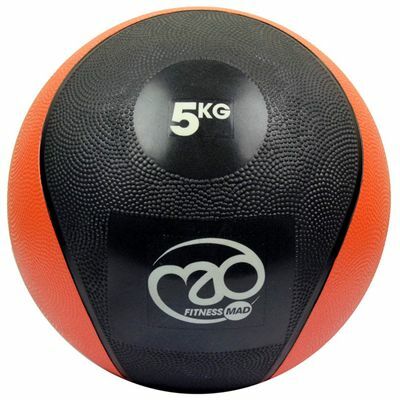 for submitting product information about Fitness Mad 5Kg PVC Medicine Ball. We aim to answer all questions within 2-3 days. If you provided your name and email address, we will email you as soon as the answer is published. for submitting product review about Fitness Mad 5Kg PVC Medicine Ball.